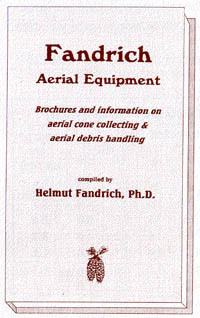 Fandrich aerial equipment is mechanizing cone harvesting operations. 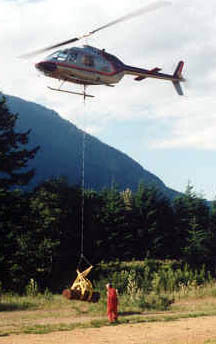 A Fandrich aerial rake on a helicopter can rapidly collect the best cones from 60 - 100 trees per hour. A Fandrich grapple on a helicopter can quickly clean creeks, transport debris and move material at 80 - 120 loads per hour. Flexible fingers on the rotors strip the cones from the branches. Fandrich powerrakes weigh about 365 lbs. The self-dumping shear weighs 425 lbs. The pilot dumps the load using a switch in the helicopter. Unloading is faster than with the manual unloading model but the machine is 45 pounds heavier so can carry a smaller load of cones. The Fandrich grapple moves logs, cleans debris from creeks and transports material using helicopters. The Fandrich grapple needs no engine, hydraulic or electric power. 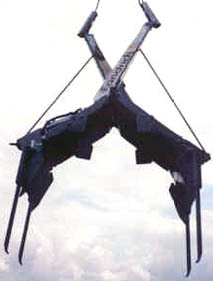 It uses helicopter lift to close arms, a switch to dump load and weight of the grapple to reset the fingers. Slender fingers penetrate deep into a pile. The arms grasp loads up to 40 in. wide and 35 in. high. Fandrich grapples can lift 1600 pounds. A new star-shaped head for the Fandrich Branch Collector makes cutting cone-laden branches more efficient and easier on the helicopter. The specially shaped hardened knives can be removed easily for sharpening. Estimate number of trees required to collect one hectolitre of cones (or the volume of cones carried per load) and distance travelled from trees to dumping site. Read volume collected per hour from the table below. Calculate collecting cost per hectolitre by dividing operating expenses (helicopter plus ground crew plus rake rental costs) by the volume collected per hour. Add in sacking, ferrying, monitoring, transportation, and fixed costs. Keep costs low by selecting dumping sites close to trees being raked. NOTE: This table was taken from IB#4. The Fandrich self-dumping shear is usually faster than the Fandrich manual unload shear when distances from trees to dumping sites are less than 3 km (2 miles). A fast pilot with a larger helicopter who dumps the load without stopping will find the self-dumper faster up to a distance of 5 km (3 miles). 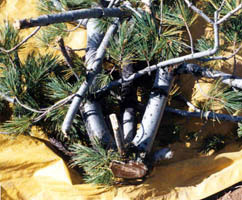 Flexible fingers on the Fandrich powerrake strip cones from branches while leaving the tree intact. A Fandrich aerial grapple cleans creeks, penetrates and moves debris, and opens up beaver dams in water. Simply hook the grapple to a helicopter and connect to a switch to make the mechanical grapple fully operational. Lifting the grapple encloses the load and pressing a switch releases the load. A Fandrich grapple can be used on small projects since the minimum rental is only 4 hours. Fandrich cone harvesters have been so successful that they have mechanized the cone collecting industry throughout North America. In 1993, 49 Fandrich aerial rakes collected nearly 10,000 hl (28,400 bu) of cones. If the seeds from these cones were planted at 4 meter intervals, the rows of seedlings would encircle the equator 160 times. Small aerial collections can often be combined with neighbouring projects to make a collection of even a few bushels feasible. 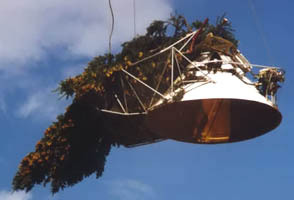 Aerial collection is usually the most cost effective method to gather the cones from the tops of trees where the best cones grow. Reservations for a Fandrich rake are best made when an aerial cone collection seems likely. Fandrich Cone Harvesters will hold a rake in reserve until we are instructed to ship it or the project is cancelled. There is no charge for making a reservation but once equipment is shipped, a one-time service charge and shipping costs apply as well as a charge based on volume of cones collected. An information book has the company's 20 years of aerial harvesting information compiled in 128 pages. If you can use it, ask for this free book or request information bulletins on particular rakes or grapples. We want to help foresters efficiently replenish their inventory with top quality cones. The forester in Oregon sounded skeptical. "The idea of cutting tree-tops for cones doesn't sound good to me," he told me over the phone. "Try out the new aerial shear," I said, "and see the results yourself." He agreed and I took a Fandrich shear to eastern Oregon. 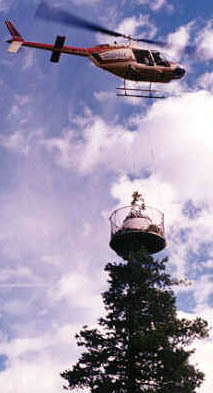 The pilot hooked the shear to his Jet Ranger and brought back a basket bulging with cone-laden white pine tree-tops. As the forester and I inspected the pile of cones and tops on the ground, we noticed something unusual. Two thirds of the tops had new leaders formed either by a single branch or by multiple branches. 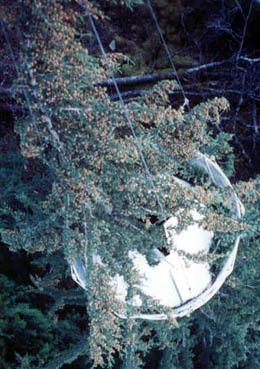 An ice storm must have blown through the high country several years before, breaking off most of the tops in its path. "It looks like the Fandrich shear does what nature does," I said, "but does it neatly. Topping eaves small clean cuts whereas nature leaves long ragged splinters." The forester looked up at the trees on the skyline. "I can hardly tell which trees have been topped," he said in amazement. When the pilot landed and reported how much easier it was to use the Fandrich shear, the skeptical forester turned into a believer. 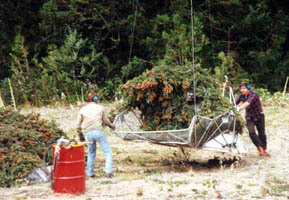 The pilot went on to collect another 528 bushels of white pine, Noble fir and Douglas fir cones with the new Fandrich aerial shear. "Cone crop was excellent in both areas. Actual picking rate by N.M. Helicopters was 5.40 HL per hour. The selected stand was along the main road so we were able to dump right there and as the chopper moved up the road we were able to do the same, unloading within 17 to 28 seconds, averaging 12 tops. Average rate for Poison Creek area was slightly less at 5.12 HL per hour due to cut blocks and access in area. ...All in all I was pleased with collections, especially the two pilots being very helpful and efficient with solving problems with the operation - experience helps." Other companies collected cones where the crop was poor to build up a supply of needed seeds. Hundreds of hectolitres of lodgepole pine cones were collected at about one hectolitre per hour. 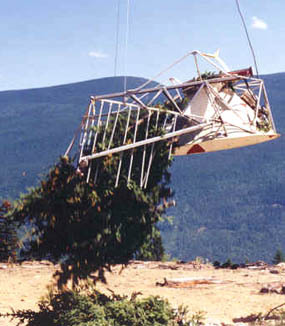 Aerial harvesting of cones is popular in British Columbia. 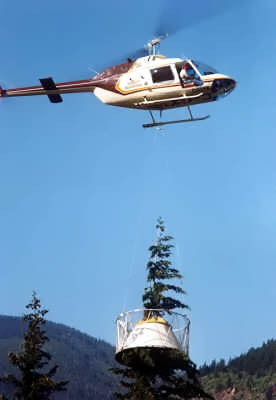 During the last 3 years 97% of abies fir cones, 69% of Douglas fir cones and 66% of spruce cones were collected aerially. Since their introduction three years ago, Fandrich shears have gained acceptance very quickly in British Columbia. Last year 88% of the cones harvested aerially were collected with Fandrich shears. 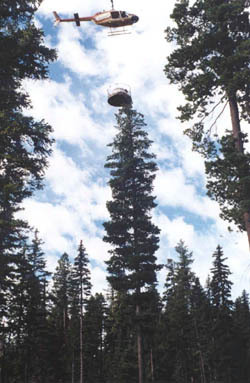 This included all of the lodgepole pine, spruce, and hemlock cones, 74% of Douglas fir cones, and 79% of Abies fir cones collected aerially. Unloading the Fandrich shear is quick and easy with the introduction of the self-dumping basket. The pilot triggers the unloading mechanism when he arrives over the unloading site and the load of cones falls to the ground or directly into a truck for transport to a more convenient sacking site. 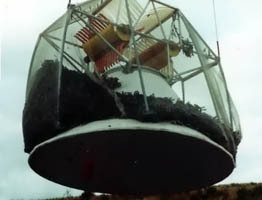 A crew is no longer required under the helicopter to unload the tops. Unloading time has been greatly reduced, making helicopter time more efficient and cost effective. Cone Collection by Method for 1988-1990 in B.C. 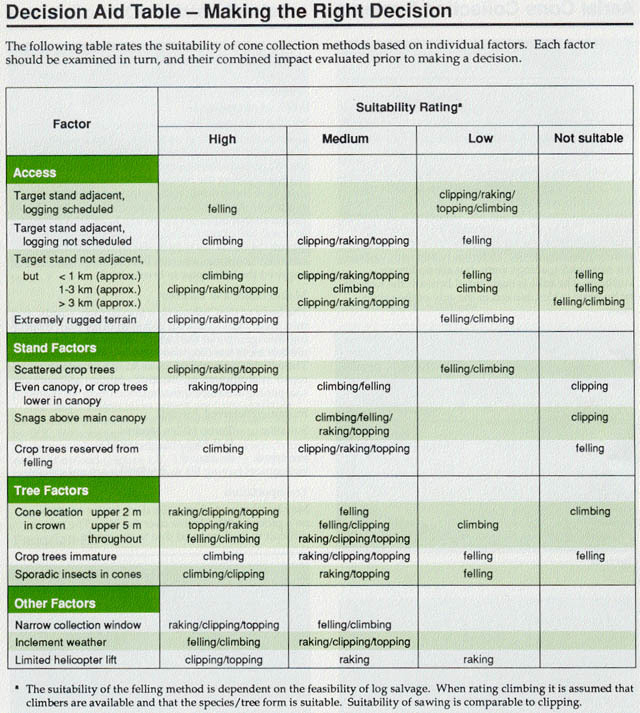 The following table was printed in "A Guide to Aerial Cone Collection Equipment and Techniques in British Columbia" by W.G. Camenzind, Ministry of Forests, Victoria, Canada, June 1990.